A violent storm has been raging for three days and nights on the Cornish coast. On the third night, 13-year-old Ethan Matthews and his younger sister Cathy are ‘struck down by a terrible illness’ and their father, owner of an inn perched precariously on a coastline promontory, has left them by themselves – their mother is dead – while he goes to summon a doctor. The children, we are told, have ‘the most insatiable taste for stories of a macabre persuasion’ so when there is the unexpected arrival at their door of a young seafaring man in his late teens who offers to share with them ‘a few tales’ he has accumulated on his travels their attention is caught immediately. This framing device provides Priestley with the opportunity to spin nine sea-soaked stories, their prevailing tone being indeed of ‘a macabre persuasion’: a casual reference early on to the writings of Edgar Allan Poe and, in particular, to The Tell-Tale Heart (‘wonderfully gruesome’) gives some indication of what we can expect, as do the echoes of Smollett and Stevenson. The note of tension and suspense throughout the stories is brilliantly maintained and their ability to deliver one unexpected twist after another will delight even the most prescient of readers. And as for the ultimate revelation…! Ethan, summarising his response to the sailor’s stories, comments how his ‘security in the rational world had taken flight’: it is a sensation with which Priestley’s readers will identify. 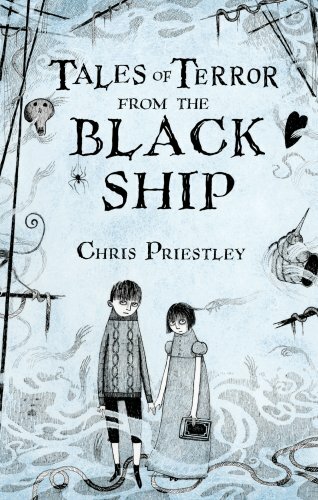 The black and white illustrations, full of creepy suggestiveness, perfectly catch the book’s atmosphere.